I have comfortably gotten into the routine of posting every Monday, Wednesday and Friday! But the question is are your reading those posts?? I sure hope you are ! Today, for Wednesday's post ,I have the color I had been using a lot lately, for nail arts from Live Your Now (LYN) Nail polishes. A pretty teal color which can be also passed as "Slightly greenish turquoise" shade is the shade named Teal me more, as in Tell me more! How cute is that! I love polishes with such names! The Base Coat from LYN nail polishes is fabulous and I have been using it for every nail art I am doing! and For colors like these (Blue and green nail polishes usually stain the nails ) one has to use base coats! All the shades dry out pretty quickly and are hence, perfect for nail art! Especially the nail arts which has lots of layers! I love the formula! It spreads like a dream, no streaks, settles perfectly and has a wonderful shiny finish which stays the same way for 2 days! Just two coats is what you need for an opaque finish! I like the medium to thick brush.The brush is soft and applies the polish really well! Bella Bronze is a gold glitter with a clear polish as the base. 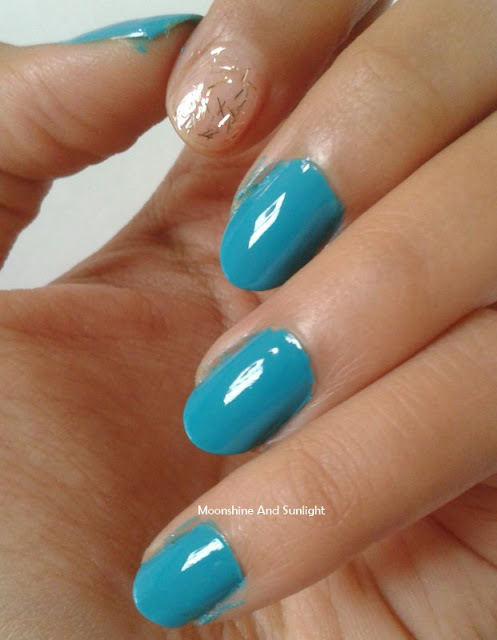 It has pale gold glitter feathers/strips which are evenly distributed throughout the polish. Given the quality, the price is perfect for this quantity! I would Highly recommend these polishes ! and you have 100 shades to chose from!!! If you have any Nail Art/ Skincare / DIY related queries, drop me a mail on priyanjanamns@gmail.com !